In our continuing discussion of Discipleship, we have been exploring the meaning of discipleship specifically in the context of the community here at Pacific Beach UMC. After last month’s post about discipleship, we have continued to have great conversations, and several members and friends of PB UMC have asked intriguing questions. It is my hope that we will continue in this dialogue, and that we can journey together toward a deeper sense of discipleship. First and foremost, discipleship begins with Jesus. From the very beginning of his ministry, Jesus gathered people together to give a new and broader understanding of God’s profound message for humanity. Those who gathered to hear Jesus were called disciples, and it’s worth remembering that it was not just “the twelve” who were named in this way. All who followed Jesus were his disciples. Today, we who gather in worship and fellowship and service continue to grow in faith and ministry. I believe that we are called to continually seek out a deeper sense of relationship with God, and that we can experience the fullest relationship when we commit ourselves completely. We are transformed, and we are invited to respond to God’s grace-filled work in us. One way to think of this in a practical way is to commit with our head, heart, and hands, both in the ways we seek God and the ways we respond to God. In this way, we engage our intellect (our head), our emotion and our passion (our heart), and our action and service (our hands) to fully live out the transforming love of God through Jesus Christ. This does not mean that all disciples live out these things in exactly the same way. Just as we are a diverse people, we are given a diversity of gifts and passions and abilities. Where some experience a drive to read theological books and essays, others explore through conversation or debate. Where some are passionate about inclusivity ministries, others are drawn to creating quilts for babies or videos for websites. Paul writes in his first letter to the church in Corinth (1 Corinthians 12) that we are given a variety of gifts even as we are empowered by the same Spirit. As we work toward giving of our whole selves in response to God’s transforming work in our lives, we use our head, heart, and hands in a diversity of ways. We recently hosted a Membership Orientation where persons considering membership at PB UMC – as well as current members who were interested in a refresher – examined the United Methodist membership covenant of prayers, presence, gifts, service, and witness. 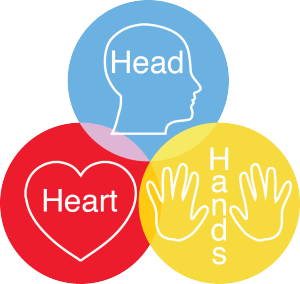 As a part of this, we distributed a new pamphlet briefly outlining this membership covenant alongside this practical commitment of head, heart, and hands. All are welcome to continue to explore discipleship using this new resource. It is available through the church office or for download using the button below. May we continue to experience God’s transformation as we share ourselves – persons transformed by God’s love through Jesus Christ and empowered by the Holy Spirit – with God’s creation.